The upper canopy of the towering Californian Redwoods, Larch and other species of trees provide shelter and shade to a kaleidoscope of ferns, shrubs, flowers and fungi. The mostly native plants not only add to the scenic value of your forest experience but are also and integral part of the forest eco-system. Ferns are commonplace in the New Zealand landscape with about 200 hundred different varieties in New Zealand half of which are endemic and can be found right throughout the country. They have evolved into forms that can cope in just about any environment from the tussock grasslands to geothermal areas to storm-battered coastal cliffs and everything in between. So not surprisingly one of the most noticeable plants dominating the understory in The Redwoods is the fern. The Kiokio or Palm-Leaf fern is the most common creeping ground fern with its new growth tinged pink. The Wheki or Rough Tree Fern is the most common of the tree ferns and grows in abundance in the Redwoods. Maori once used this fern for forming walls of their houses as it lasts well in the ground. Today it is still used for fences and steps and to define forest tracks. The Ponga or Silver Tree Fern is one of the most distinctive with its silvery white stalk and underside of mature fronds. It is one of New Zealand’s national emblems shown clearly on the chest of the All Blacks rugby jersey. The Mamaku or Black Tree Fern is the most spectacular of the ferns found in The Redwoods. Growing up to 20 metres tall the fronds arch out from thick black storks. This is the largest of the tree ferns and was very important to Maori in times gone by being used as a food, as a medicine and lining for food stores. Aside from ferns a variety of spleenwort, pittosporums, coprosmas and native re-growth can be seen. Along with a spattering of brightly coloured imports such as foxgloves. There are many different animals, birds and insects which play an important role in maintaining the ecological balance of the forest. With no dangerous wildlife the forest is a beautiful and safe place to visit. 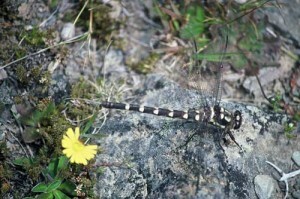 Unlike some forests in warmer climates where there is an abundance of colourful birds and animals, New Zealand’s wildlife tends to blend in with the environment and is quite inconspicuous. You may come across the ‘Uropetala Carovei’ a native dragonfly known as the ‘devil’s darning needle’ due to its large size of about 8cm. Often heard throughout the forest during the warmer months is the loud song of the Clapping Cicada, but unless you dig around in the forest fl oor you will only see a small fraction of the insects that have made the forest their home. A bug cabinet inside The Redwoods Gift Shop & Visitor Centre will give a greater appreciation of other insects that can be found. Species of birds seen most often include Tomtits, Chaffinches, Blackbirds, Waxeyes and Californian Quails. 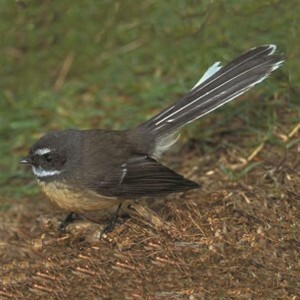 The friendly and inquisitive Fantail may also follow you on your walk. Cuckoo or a Harrier Hawke. You are likely to come across smaller animals such as rabbits but you could also see a wallaby, and if you really lucky a deer or wild pig. bins. The Ruru or Morepork can also be heard calling into the night.